Industrial Style Loft - available! 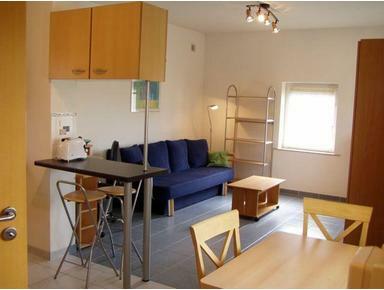 Completely new and furnished 137 m² Loft suite in Trier for rent. Simply move in and enjoy the comfort: your home away from home for the first few weeks, a few months, or maybe even longer. We guarantee you clean, contemporary accommodation that is so well furnished you can move in with just your suitcase. You can look forward to amenities such as fast WiFi and Parking garage. The special price of 2500 €/ month (short time 125€/day - minimum rental time is 2 weeks) includes all costs like electricity, heating, water, wifi, parking, incl. cleaning 1 time/month / except fee for final cleaning at the end of rental time 150€). We can offer a weekly cleaning service at additional costs. At about 137 m², the Loft will impress you with it´s industrial style and a large terrace, a beautiful living room including a high end designer Sofa (Minotti), a Custom made Designer kitchen and a large eating area with oak table and 4 dining chairs, 1 large sleeping room with huge wardrobe, 1 Boffi italy deigner bathroom with large bathtub and seperate shower, 1 Guest WC and a laundry room. 1 day free use Coworking Space Bobinethöfe / month incl.